To prepare the filling, place the sliced apples, dried cherries, spices, sea salt, barley malt, maple syrup and flour in a large mixing bowl. Mix to evenly coat apples with spices and syrup. Set aside while you prepare the crust. Preheat the oven to 350°. To prepare the crust, combine the dry ingredients and mix. Combine the wet ingredients and mix. Blend the wet and dry ingredients and form into a ball of dough. Sprinkle with a little more flour, if too moist. Divide the dough in half. Roll out one half of the dough into a thin crust, about 1/8 inch thick, on a lightly floured board. Place the crust in a 9 inch pie plate. Mix the filling again and place on top of the crust in the pie plate. Roll out the remaining dough, forming a top crust. Dip your fingers in a small bowl of cold water and moisten the edges of the bottom crust. Place the top crust on the pie, trim and crimp the edges to seal with your fingers or press with a fork. Poke several holes in the center of the pie crust, using a fork, to form an X shape. This allows air to escape during baking. 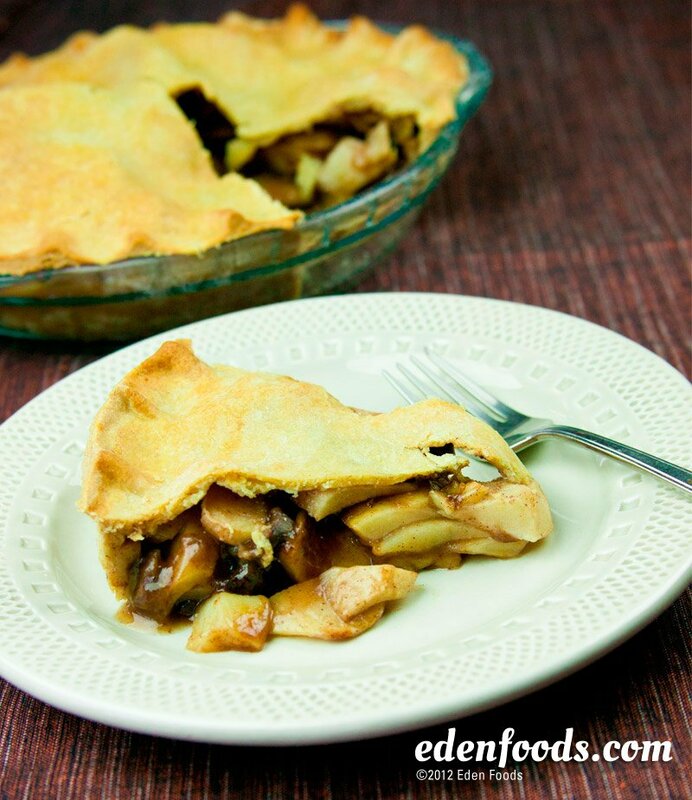 Bake for 35 to 40 minutes or until the crust is golden and the apples are tender. Test with a fork or bamboo skewer to see if the apples are done. Remove and allow to cool before slicing.